Once named Mt Cutheringa, it is now known as Castle Hill and it's the most popular fitness place to be within Townsville City. There are many walking tracks to take to the top and it is a great way to get fit and be active. From the road to the more intensive goat tracks & hell's staircase, there's a route for everyone and any fitness level. Most of the area is taken up with the Castle Hill Reserve with only a small part in the north-east of the area being available for housing. At an elevation of 286m above sea level it is accually taller than Mt Marlow (213m a.s.l.) but just short of being classified as a mountain (304.8 metres or 1,000 feet). In July 1980, a group of high school students poured soil into a wooden pyramid – enough to push Castle Hill into the "mountain" class and was called Castle Mountain for a short time, officially called Cutheringa Mountain. 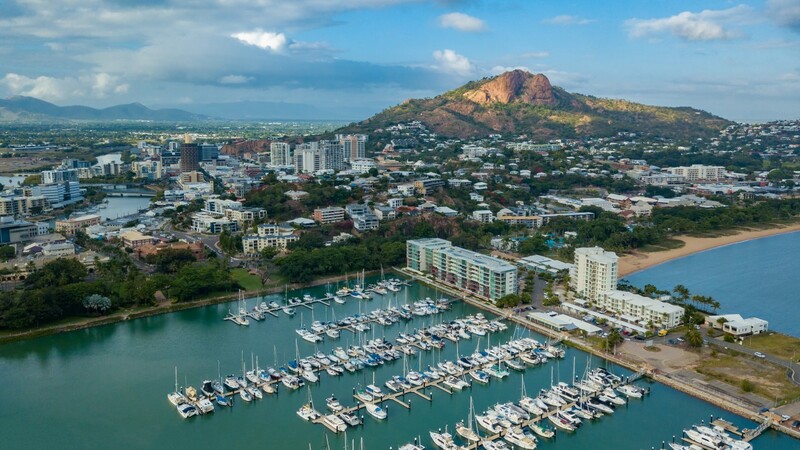 Just metres short of a mountain, Castle Hill is a heritage-listed lone pink monolithic granite giant that overlooks the centre of Townsville making it a perfect landmark for tourists to orientate themselves. It's a suburb of Townsville that dominates the city skyline. The other iconic centre piece for the city is a skyscraper known as the "Sugar Shaker". As well as offering vehicle access to the summit, Castle Hill provides a number of popular walking tracks frequented by many locals! 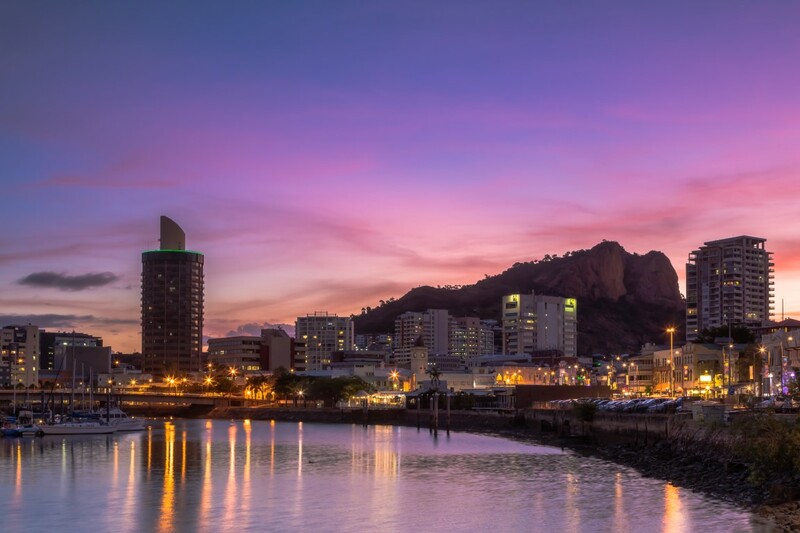 The 360-degree views of Townsville at the top are well worth the journey, in particularly for sunrise or sunset; Even the view of the city lights is quite spectacular. A World War II observation bunker sits on one corner of the Hill as a reminder of Castle Hill's military history. The Hill's vantage was used by visiting American soldiers during World War II. A signboard up top details short trails leading to various lookout points. There are also a few rock climbing routes on Castle Hill. Castle Hill facilities include car parking, coach parking, public toilets, a drinking fountain and shaded seating to enjoy while taking in some of the best views of the city and across to Magnetic Island & Cleveland Bay. It's quite fun to speed down the hill on a bicycle but watch your speed and do not exceed 40km per hour, otherwise risk a fine. Walkers and runners must walk no more than two people across - this allows safe space for all users, including cars and cyclists. Townsville also has many great walkways and bikeways throughout the city. There are in fact 15 official trails to it's summit and a few other pirate tracks. All the tracks are well worn and easily followed. Please note that short cutting causes erosion. The most popular Castle Hill walking trail, the Cudtheringa Track is accessed from opposite the first car park at the bottom of Castle Hill Road, and spits walkers out just shy of the summit. While the start and end are challenging due to the sharper incline, the mid section is moderate and has stunning views out to the city and Magnetic Island. If you don't like crowds, avoid it around 5-7pm on weekdays as this track in particular tends to be the choice for post-work workouts. During quieter times, it's also a fantastic option to practise your trail running. The steps at the end are a killer! This trail is nice and challenging, but not nearly as populated as the city-side tracks. Starting at James Street in West End (or you can go via the gate at the start of Green Street), it takes you about three quarters of the way up Castle Hill Road. From here, you can reach the top via the bitumen, or continue off-road up the "Scramble Track". The Ironbark Track is very rocky and can be a little slippering coming down, but it's a great heart starter. It starts steep then tapers off for about 20m, before it's up again (unlike Cudtheringa where there are more flat sections to catch your breath). These's a bench at the top of the trail for a rest (and some tricep dips). Branching off from the Ironbark track, the Triandra trail links north West End (near Stagpole Street) to the Dianella and Maidenhair Tracks in east West End, near the cemetery. It's a largely flat trail as it traces the base of the hill, but still has impressive views out to Mount Stuart. Assuming you are heading towards the CBD, there is a brief break in the track at the disused quarry (as you cross over the old quarry road), but you pick the trail straight up at the abandoned concrete structure (which is decorated with Bart Simpson). You will eventually come to a fork in the track - go right, or the 'low road'. The most challenging part of the track is closer to the West End Cemetery where you need to scramble over a rock face - stay low to the ground and scoot along on your bum if you need to. There is a rocky downhill section after this, but these are really the only tricky bits in an otherwise relatively easy and enjoyable walk. After heavy rain one of the walls of the quarry turns into a waterfall. If you want to avoid the brief rock face scramble that's in the 'low road' section of the Triandra Track, you can turn left in the fork (assuming you are heading towards the CBD). This takes you onto the high road and over relatively easy terrain until you come to the base of the boulder at the Dianella Track. You can go left here and up and over the boulder to eventually reach the summit, or you can bear right and head downhill to either exit the trail at the West End Cemetery on Church Street; or head right onto the Maidenhair Track, which eventually links up with the Goat Track in town. Cuts off the rock face on the 'low road' if you are unsteady on your feet. Considered one of the most challenging of the Hill's offering. Starting at the end of Church Street in West End, behind the West End Cemetery, it delivers you near the summit, just a bit further down from the Cudtheringa trail. It is largely straight up with little scope for breath-catching and requires you to climb over a large boulder near the start. Once you are on top of this rock the views are spectacular - take in the view of Mount Stuart and Cleveland Bay. The top of this rock flattens out nicely so you could almost take a picnic up there to enjoy the ambience. There's a brief downhill section after this, but then it's straight up the rocky climb to the top. Be careful if you are coming back this way as it can get slippery. This walk is relatively easy as it has few climbs and hugs the base of the hill from West End Cemetery to the Goat Track in town. There are some nice pretty sections, including a bridge over a stream that flows in the wet season; and a little rock pool that's big enough for the dog to cool off in (again, after it's rained). It gets a bit more challenging near the Goat Track where a little bit of rock hopping is required. This easy trail starts just behind the West End Cemetery on Church Street, West End, and offers a pleasant walk parallel to the Maidenhair Track. Although the elevation isn't high, the view out to Mount Stuart is surprisingly impressive. You will come out on Wilson Street, where there's a small climb via the road until you'll re-join the track. Follow a short set of stairs and you'll eventually come to the Maidenhair Track. It offers fantastic vista with minimal effort. Starting from Hillside Crescent just outside of the CBD, the best way to describe the Goat Track is short and sharp. Getting to it requires a steep climb up the road, which offers some brief respite once you get to the track, before the incline begins again to take you to a lookout at the intersection of the Cudtheringa Track. The Goat Track is a good way to add a bit of variation if you usually just stick to the Cudtheringa Track and you prefer the city-side tracks. This track has views over the city, Magnetic Island, tip of Pallarenda and around to Cleveland Bay from the lookout. It's a 'sneaky shortcut track' if you are running late/lacking energy as it allows you to cut a big corner of road off if you are going up or coming down the hill. While this track is short and easy, it's also very convenient. A lot of walkers know it exists, but many don't realise that it actually starts from Balmoral Place (off Yarrawonga Drive) in Yarrawonga. Handy to know if you park at the bottom of Jacob's Ladder, do that challenging climb, turn right onto Yarrawonga Drive, right into Balmoral Place and then onto the Erythrina Trail and the hill. It seems not many people know the existence of this fantastic trail that starts on William Street in West End and finishes half way up the hill, just opposite the end of the Erythrina Track. It has a rocky and relatively steep, but steady, start (watch out if you are coming back this way as it does get slippery and muddy at times), then it flattens out onto the ridgeline where there are stunning views of The Strand and Magnetic Island one way and Mount Stuart the other - 360 degrees of bliss. The track is easier after this, still climbing, but quite gradually, and with the help of stairs in some sections. The ebst part of this track is the jaw-dropping 360 degree views! Also known as "Suicide" and "Heartbreak", this unmarked trail takes you around the back of the summit to join the Radar Hill short walk. With two descent climbs - the last being the most significant - this trail is very steep and challenging (both physically and in terms of the unstable terrain) and is not for the faint-hearted. There are some amazing views when you pause after the first climb that look out to Magnetic Island and back over the suburbs of Townsville, out to the ranges. You will find it opposite the top of the Ironbark Track and it's a great way to end that walk with a bang. Alternatively, turn left and it eventually connects with the Erythrina Track. (P.S: You may encounter a bike heading downhill on the rare occasion, so keep your eyes and ears open while you're puffing). Local walkers tell us this trail is also known as "The Ladies' Track" because it was the inconspicuous route that 'female friends' took to visit the soldiers manning the pillboxes on the top of the Hill in WWII. Unsignposted, this trail tends to get overgrown in the wet season, but it is marked with coloured ribbon and blue paint. It stretches from the Erythrina Track to the base of the "Scramble Track", which is opposite the Ironbark Track. It's relatively easy with no steep climbs and fantastic views, and is a fantastic way to add variety to your walk if you want to try something different to the road. Another track named by local walkers, the cap certainly fits as this track is spectacular yet a little perilous if you were to lose your footing in some parts (there are no safety barriers). Unmarked, it branches off right from the Goat Track just after the intersection of the Cudtheringa Track, about 3m past the top of the concrete stairs. The path has loose rocks initially, like a riverbed, then moves into steep boulders (pulling up with hands is required in some parts). The views are to die for (pardon the pun) and survey the whole city, Cleveland Bay, the ranges and out to Magnetic Island. The track can be hard to follow in parts, particularly over the rocky sections when it's sometimes unclear which way to scramble, but it becomes more obvious in the second part as there are nice big white arrows painted. The track eventually spits you out at the end of the Summit Walk at the eastern-most lookout - a great place to catch your breath. While this track is challenging and rewarding, it's not suitable for pets, children or those with a fear of heights. And we would not recommend going down. Heart-racer - both from the physical exertion and being so elevated and exposed. Given this name by a group of local walkers, this track is certainly not as unassuming as its name. A bit tricky to find the entrance when it's overgrown, this one starts on the Maidenhair Track, just a bit further east of where the Maidenhair Lower joins the Maidenhair Track (look out for the metal bridge). It finishes near the top of the Dianella Track, where you can access Castle Hill Road. We'd say this trail surpasses the Dianella Track for difficulty - both in a technical and fitness sense - as it's particularly steep, climbs the whole way and has even more large boulders to climb over. But there are certainly some breathtaking views. Apart from the concealed start, the Blue Spot Track is well-worn and clearly marked with white painted arrows, so there's little chance of getting lost (just as well as, if you take the wrong turn, you'll come across a humpy where a hermit resides). We wouldn't recommend this trail for dogs or young children, and it's definitely an 'up' trail (too dangerous going down). The interesting rock formations and the serenity. This relatively easy track is mostly flat, but has sections of small climbs. It starts on Potts Street (near Belgian Gardens State School, just off the footpath) and can be followed around the back of the school and up to the water reservoir at the end of Grange Court. There are a few rocks, but nothing very technical. If you want to continue to the hill from here, pay attention: Once you've just passed the water reservoir turn right. It looks like you are going into the back of some units, but there's actually a footpath that takes you to Chandon Place. Follow this up to Yarrawonga Drive, turn right, then follow this street until you hit Balmoral Place on the right - this road section is all uphill. The Erythrina Track starts from the end of this cul-de-sac, which takes you to Castle Hill Road. Voila! The combination of peaceful off-road scrub with bitumen hills - a good mix. You may not notice this track if you didn't know where to look - on Castle Hill Road, it starts just after the stairs to the Cudtheringa Track, on the left-hand side before the bend. There's some white paint at the start. This well-maintained trail eventually links to the Scramble Track, opposite the Ironbark Track and has some spectacular views and minor rock scrambles along the way. Just a word of warning if you explore this track: While it's not an official mountain bike track, downhill mountain bikers built it and do occasionally use it. We advise that you exercise caution at all times if you do decide to walk it (including no earphones or dogs). Being able to choose from a couple of different trail directions within the same route - all ways lead back to the main track. These are all short, well-maintained, concreted paths you can do at the top of Castle Hill. They are particularly great for visitors as they afford unrivalled views of Townsville and surrounds and have historical significance, but the Summit Walk is great for those wanting an extra physical challenge. Run that flight of stairs a few times and it will finish you off before your descent. P.S. If you know more tracks that we haven't included, we would love to hear about them! Gold Creek Falls is worth a visit alone but the entire Gold Creek is comprised of waterfall after waterfall. This creek showcases beautiful, untouched scenery with mossy rocks and large king ferns.